The Derby Schools Linking Programme was launched in 2017 by Global Education Derby, a small Development Education Centre with expertise in local and international linking. Working closely with another friendly local charity, The Open Centre, we recruited 16 enthusiastic classes to participate, engaging 437 primary school children! This year the programme has grown so that there are 23 classes engaged in linking 512 children from 17 primary schools, including 1 special school. We are particularly pleased that five of our links have continued from last year, even though there has been a change of staff in many cases. 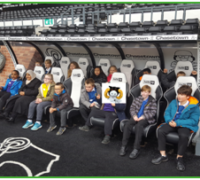 We facilitated our own neutral venue event at Pride Park Stadium in Derby in partnership with The Open Centre and Derby County Community Trust. This gave us hands on experience, working directly with the students and teachers, allowing us to get to know them all in greater depth. 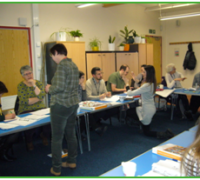 Workshops focused on small group discussion on images of Britain, making identity badges for each other and a stadium tour. In addition to this, six classes requested further support with facilitating their school to school visits in the Summer Term. We managed to provide this extra support using some Building Stronger Britain Together (BSBT) grant funding we had received. 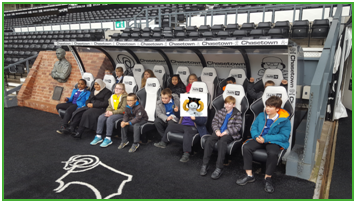 KS2 Case study: Darley Dale Primary School, Derbyshire (Y5) and St Giles (Special) School, Derby The first meeting between the children at Darley Dale Primary School and St Giles School was held at Pride Park Stadium. The programme was adapted to ensure that all children could achieve and develop their skills within each activity. 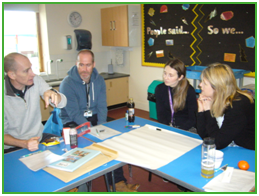 The Headteacher of Darley Dale thought this adaption was particularly helpful for the children who attend Darley Dale as this showed them a range of differing needs other children may have, even though they were of a similar age. 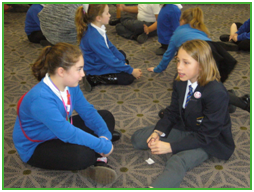 Lawn Primary had two classes taking part in the linking project last year, each class linked to a different school. 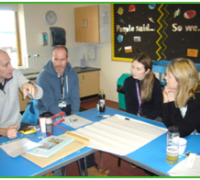 This was the first school to link successfully with more than one partner and was supported by a high level of commitment towards the Programme and excellent communication skills. We now have multiple links across the city and the county with more interested in joining the programme next year. 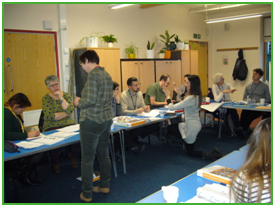 We were delighted with the response from everyone who participated in the linking activity days, including 17 parents/governors, 19 teachers and 28 teaching assistants/students. Roll on next year!